Cream biscuits are quite famous among the kids. Licking the cream centres is part of everyone's childhood memories, isn't it? Me and my kids love cream biscuits. 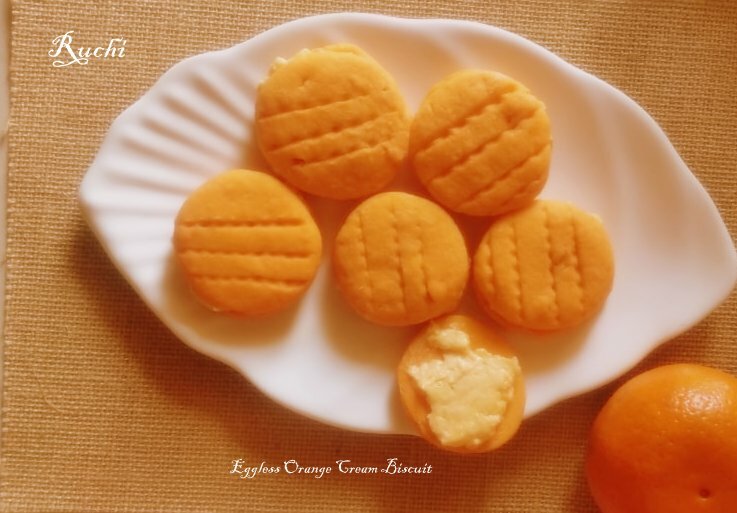 For Christmas holidays, I thought of preparing Orange Cream biscuits. 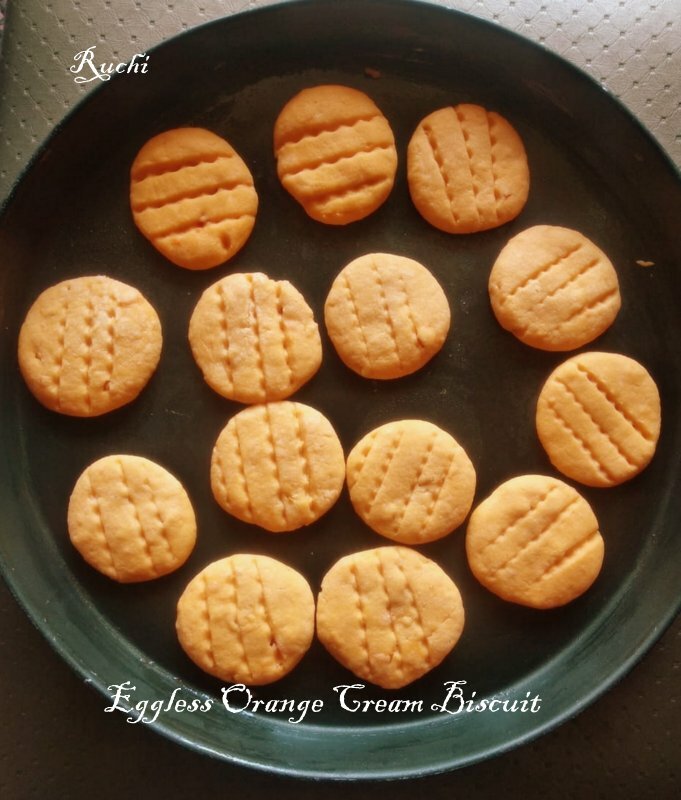 Light and fluffy orange biscuits made with fresh orange juice and zest. 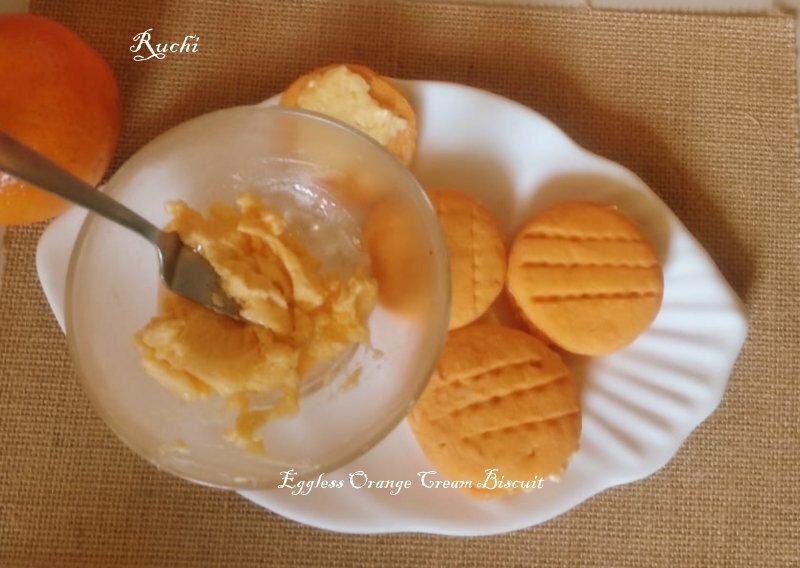 It tastes very crunchy and flavor of the orange makes this biscuit more refreshing and yum! 1. Preheat the oven to 180 degrees fan. Line two baking trays with parchment paper. 2. Sieve together the flour, cornflour . Whisk butter and sugar in a bowl until light and fluffy, add flour, custard powder, Orange zest and colour. Mix well to form a dough. 3. Roll out the dough in a floured surface to about 1/2 cm thick and cut out the circles. Use the back of a fork to imprint the top of each ball, then refrigerate for 10 minutes. 6.Meanwhile make the buttercream filling by combining the softened butter and sieved icing sugar together and add orange juice until smooth, creamy finish. 7.Once the biscuits are cool, match them up into equal-size pairs. 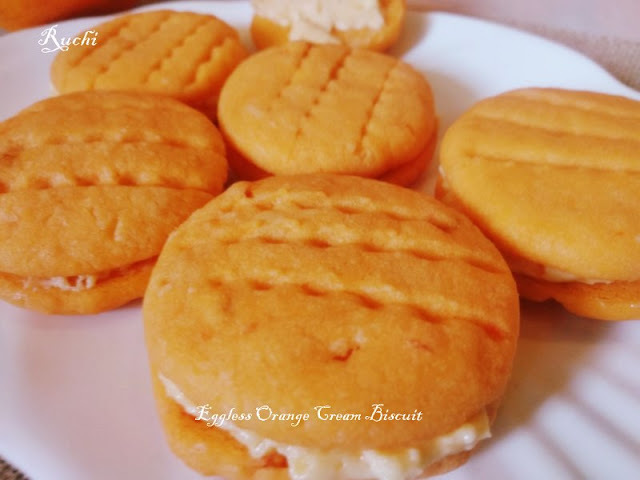 Put a heaped teaspoon of filling in the centre of one biscuit, place a second biscuit on top and gently press together so the filling spreads towards the edges together to form your orange cream biscuits and Serve. 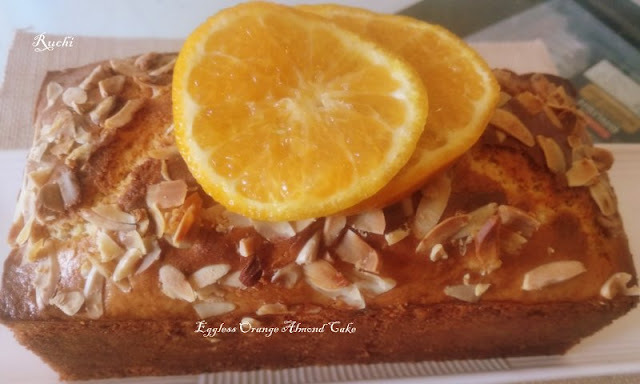 Eggless Orange Almond Cake ! Inspired by the yummy orange and almond cake watching in food tv last week, I thought I’d attempt to bake an orange and almond cake myself. Orange and almonds are a great combination. I use fresh orange zest and orange juice in the batter for the flavour. 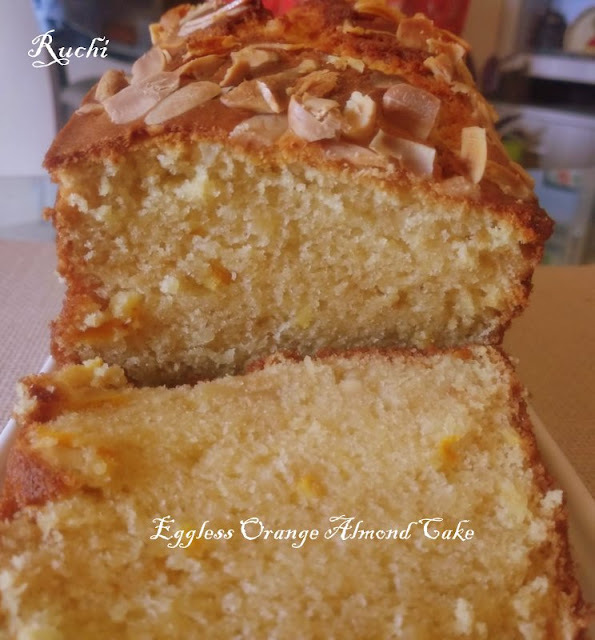 This adds natural sweetness and also enhances the orange aroma, I also use ground almonds in the recipe for a very interesting texture.The almond flavour with a hint of orange makes the cake moist and tasty with good texture If you like zesty oranges, this is the cake for you! Everyone in my home loved this cake, it was a hit! 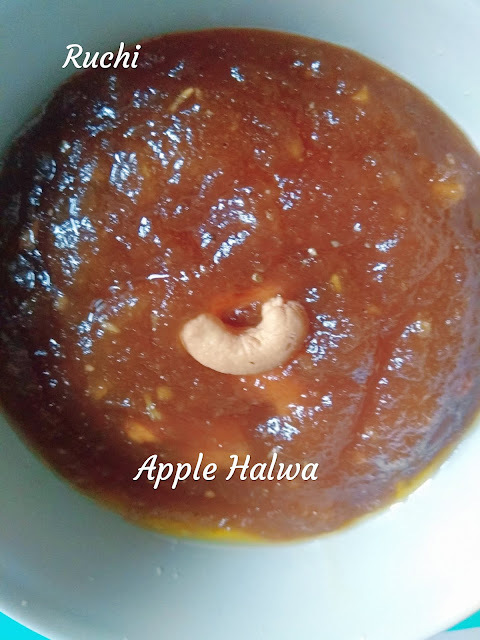 The cake makes a simple and comforting Tea cake for your evening time with your hot cup of Tea/coffee! 1 Pre-heat an oven to 180 degree C, line a cake pan and grease/line with parchment. 2. Sift the flour with baking soda, salt and baking powder and add Almond meal. 3. Cream the butter and condensed milk, vanilla extract , almond essence and orange zest and juice together in a mixing bowl beat lightly. 4.Start adding above the flour mixture little by little. and chopped almond in the liquid. Make sure that everything is mixed well. 5. Once all the flour has been mixed check the batter consistency .Pour the batter into a greased, lined mould. Sprinkle chopped almonds. 6. Bake for 30 mins or or till the wooden stick comes out clean. cool the cake for a few minutes and it is ready to be served. 7. 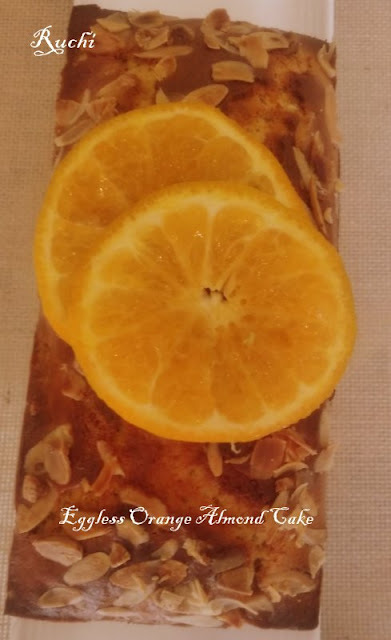 Enjoy the Eggless Orange Almond Cake with hot chai/coffee!